In The Crown at the Carolina! Ariel Pocock and Chad Eby bring a fresh, unpredictable, and intimate duo concert to The Crown! 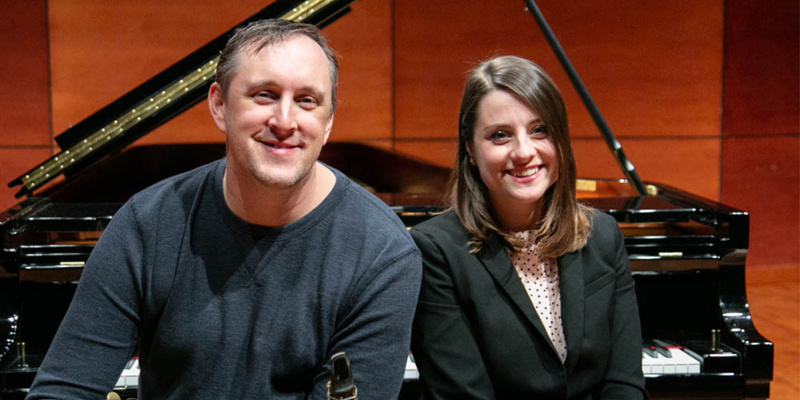 Since first joining forces in 2017, Ariel and Chad have delighted audiences across the region with their synergy and wit as members of the Piedmont Triad Jazz Orchestra and a host of other ensembles. In their first duo performance, they’ll present new original songs plus unexpected surprises by Harry Connick, Jr., Keith Jarrett, Miles Davis, and more. And it all happens in the up-close-and personal and intimate confines of The Crown…don’t miss it! 25-year-old Ariel Pocock has received international acclaim as an equally captivating jazz pianist, vocalist, and composer. Ariel‘s notable performances as a headline act include the Montreal International Jazz Festival, the Gilmore International Keyboard Festival, the Rochester International Jazz Festival, the Vancouver International Jazz Festival, the 2014 Jazz Cruise, the Tokyo Jazz Festival, the Quebec City International Jazz Festival, the Stanford Jazz Workshop, and many more. Ariel‘s original compositions and songs draw inspiration from a wide array of sources: Cuban and Brazilian folk music, the Great American Songbook, modern jazz composers such as Chick Corea and Brad Mehldau, and songwriters like Joni Mitchell, Randy Newman, and Paul Simon. title track by The Weepies, Living in Twilight and the heartbreaking Kate McGarrigale penned Go Leave. Ariel’s chops as a composer/songwriter are on display with original’s Gonzalo’s Melody – and the reflective So Long. Living in Twilight spent over three weeks at #10 on the JazzWeek radio play charts, and Ariel continues to tour with her trio to promote the album. February of 2010, featuring Steve Haines, Jason Marsalis, Doug Wamble, and Branford Marsalis. “New Business” followed in 2012, centered around a suite of original compositions based on the visual art of Trenton Doyle Hancock. His newest release, “The Sweet Shel Suite: Music Inspired by Shel Silverstein”, received a four star rating from DownBeat magazine, and features his working quartet with trumpeter Brandon Lee, bassist Steve Haines, and drummer Daniel Faust. Since 2006, Chad has taught in the Miles Davis Jazz Studies Program at UNC-Greensboro, where he directs Jazz Ensemble I, teaches Jazz History and applied jazz lessons, and co-leads the Spartan Jazz Collective, a septet made up of faculty and a rotating cast of students. In 2015, he was honored with the UNCG School of Music, Theatre and Dance’s Outstanding Teaching Award. Eby is a D’Addario Woodwinds Performing Artist, a Conn-Selmer Endorsing Artist, a clinician for Jazz at Lincoln Center’s Essentially Ellington program, and has been a featured guest artist/clinician at universities across the country. He lives in Greensboro, NC with his wife Carmen, who is a professional clarinetist, and their two children. Tickets are $13 for Adults, $10 for Seniors, Students, and Military. A $1 facility fee will be added to each ticket. Prices include NC sales tax. Guests can also opt to have tickets mailed to them for a $1 postage fee, or can pick tickets up at will call for no additional charge. Please note: There is an additional $3.50 per ticket service fee on web purchases. To avoid this charge, guests can call the Carolina Theatre Box Office at 336-333-2605 Monday through Friday from noon until 5PM, or visit the Carolina Theatre in person. Carolina Theatre Volunteers Want to Volunteer? Click here! Annual Fund - Donate Now! Never miss a film, concert or special offer! © 2019 The Carolina Theatre. All Rights Reserved.